Think of working out in the gym. There is time when you work the muscles, and there is time when you rest them. The cycle of workout and rest increases blood flow to those muscles and enables them to grow in a sustainable fashion. If you only rested, you would never build your muscles. If you only worked, you would overtax yourself and break yourself down. 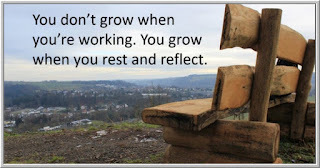 Growth occurs over multiple cycles of work and rest. This is an important lesson of the Sabbath in the world's religious traditions. After a period of creation, we rest and renew. Some traders fail because they work too hard. Others fail because they hardly work. Performance is achieved when we effectively alternate effort and renewal. Growth occurs in the cycles of doing and reflecting that comprise deliberate practice. Thanks to a savvy portfolio manager who passed along this article on how the Golden State Warriors make use of their halftime to dominate the third quarter of their games. It is fascinating to see how the coaches plan for the halftime during the game, collecting videos that will help the team build their confidence and focus on the right things in the second half. The period of rest during halftime becomes an integral part of improved performance for the remainder of the game. Mike Bellafiore, in a recent blog post, notes that this same dynamic occurs on the trading floor. Traders keep running "playbooks" of their best trades and use breaks during the trading day to review their plays and share insights with other traders. When I worked at Kingstree in Chicago, traders would formally divide their trading day into morning and afternoon sessions, with a break in between. They allocated separate risk (loss limits) to the two sessions, effectively creating two trading "days" in one. Midday served as a halftime, a period of rest when they could learn from what they did right and wrong, update market views, share insights with colleagues, and rejuvenate. What are your halftime drills? 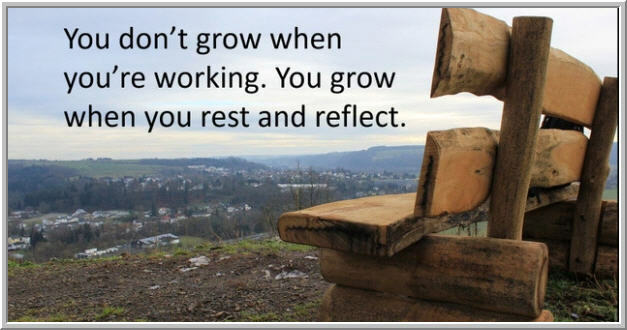 How are you utilizing periods of rest in your trading? In your life? When we increase the frequency of cycles between "performance" and "halftime", we speed our deliberate practice and development. How we rest is as important as how we work.